The community representatives for the 2012 Winter Warm-Up and Blues' Community Challenge. 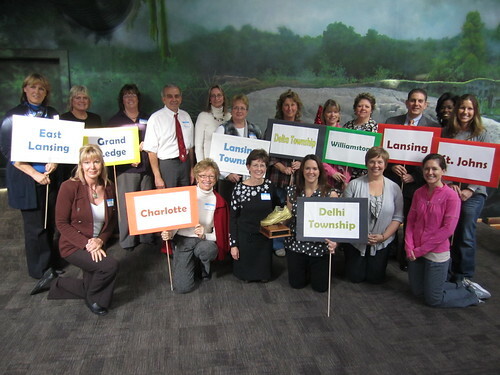 The Community Partners in Health 2012 Winter Warm-Up has begun after a kickoff ceremony on Saturday, Jan. 21 at the Lansing Mall. I’m excited to announce that The Blues’ Community Challenge, a contest between nine Lansing-area communities, is under way for the third consecutive year (the Winter Warm-Up is now in its ninth year) — and I must say I love it! This is an entirely free program which offers resources for developing positive and healthy habits consisting of daily physical activity and healthy eating. This eight-week program provides tools, information and the support network for you to do just that, all within your own community. This program has improved countless lives in the greater Lansing area over the past eight years (I’ve been there, I’ve seen it year after year) and I personally feel that it helps people come together to form a type of “family team” that supports each other and encourages healthier habits. Jan. 28 — What should you wear and what equipment should you have? Having the correct clothing and shoes are an essential first step in starting a workout routine. Learn how to dress for both cold and hot weather, find the right shoe for you and stay injury free. Walking and exercise improves the flow of oxygen to your brain and the endorphins that are produced during exercise provide natural stress relief! Learn how physical activity can help you manage stress. Feb. 11 — Are you getting the most out of your workout? February is heart month. How do you measure the intensity of your workout? Learn how to use heart rate and rating of perceived exertion as a means to determine intensity and maximize your training. People who begin an exercise program need to know the importance of nutrition in fueling their body. Learn what foods to eat before and after exercise to improve performance, maximize weight loss and feel great! Falls are the leading cause of injury in the elderly. Learn how to train your body to prevent yourself from falling during exercise. March 3 — Pump it up! Learn how strength training will allow you to achieve a healthy weight. This will not only enhance your ability to walk, but help prevent illness, injury and disease. The big day when all the participants are invited to return to the Lansing Mall for the Grand Celeberation! The winners of the Blues’ Community Challenge will be revealed and individual awards presented. And I just have to mention some of the awards, which makes this Community Challenge even more fun. Blue Cross Blue Shield of Michigan will be giving awards to the participating community teams, with larger rewards going to those having the most people logging the most miles. These grants will be focused on public health and wellness projects in each community. Facilitated a unique and fun healthy lifestyle event in the community, workplace, place of worship, etc. There will also be an award given at the Grand Celebration, that of the traveling Golden Shoe Trophy, an actual gold painted shoe that will be presented to the winning community. It is a true honor to be given this prestigious award … one that is surely deserving of a few photographs, to say the least. It would be great to add up all the miles through the past years to actually know how many miles the Golden Shoe represents. Last year there were more than 106,270 miles logged by the 1,673 registered participants included in the challenge; I feel that this year there will be even more! Please take a moment to visit the Community Partners in Health website or their Facebook page and share the journey right along with the participants… or consider creating a community challenge in your own neck of the woods. It’s just another way to lead Michigan to a healthier — and HAPPIER — future!